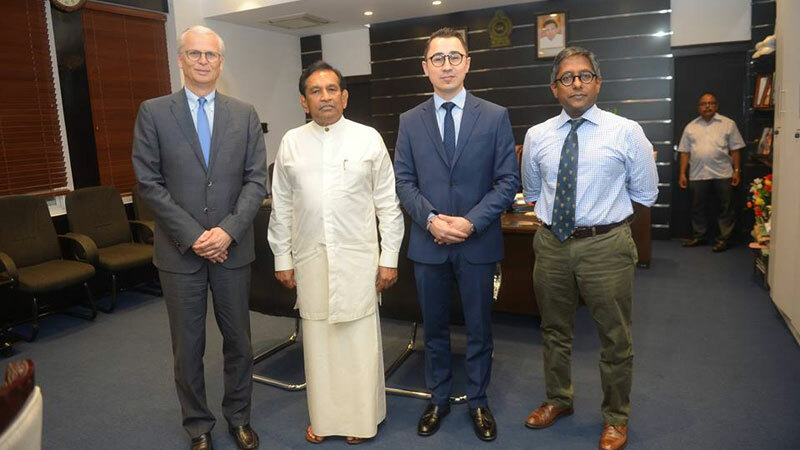 A senior delegation from the Swiss pharmaceutical giant, Roche, met Health, Nutrition & Indigenous Medicine Minister Dr. Rajitha Senaratne on April 5th to discuss opportunities to start such services, which would revolutionize cancer care in the country, Health Ministry spokesman said. According to the spokesman, the delegation from Roche was led by Mr Adriano Treve, Area Head for Central Eastern Europe, Turkey, Russia and the Indian Sub-continent. He was accompanied by Dr.Toylan Senel of Roche and senior officials of Baurs, the local market authorization holder for Roche in Sri Lanka. The discussion centered around many areas in healthcare including provision of Roche expertise to improve cancer diagnosis through genetic mapping for personalized treatment, possibility of providing advanced therapies invented by Roche (e.g. pertuzumab) at more competitive prices, as well as provision of blood clotting factor replacement therapy for patients suffering from Haemophilia free of charge through global agencies, he said. Minister Dr. Senaratne thanked the delegation for undertaking the visit and proposing to introduce such innovative therapies in Sri Lanka. He emphasized the Ministry’s desire to bring advanced treatment options for patients in Sri Lanka, especially for those suffering from chronic diseases like cancer, while ensuring cost-effectiveness so that more patients could have access to such treatments.